April 1, 2011 - “Suddenly, the left engine lost power, sputtered and quit! With the ice and only one engine, we started losing altitude quite fast, 3,000 or 4,000 feet in just a couple of minutes. 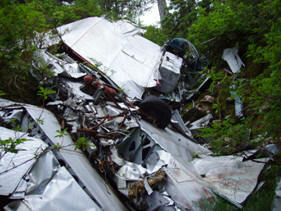 The pilot, Harold Gillam, picked up the microphone and called Ketchikan. ‘One engine has conked out, expect trouble!’ Glimpsing mountains through the window, he dropped the mike. So begins an incredible true story of adventure, faith, and survival in war time Alaska. Joseph Henderson Tippets, originally from Arimo, Idaho, was a young airways engineer with the Civil Aeronautics Administration (CAA) in Anchorage, Alaska. He had been visiting his critically ill mother in Utah over Christmas and was now returning to the North as one of the five passengers on board a Lockheed Electra 10-B owned by the Morrison-Knudsen Company of Boise. They had departed from Seattle’s Boeing Field about one-thirty in the afternoon on January 5, 1943, headed to Annette Island, the main refueling stop for flights to Anchorage. As the hours passed, clear weather over Victoria, B.C., unexpectedly gave way to icy turbulence and poor visibility. The pilot, Harold Gillam, was considered one of the best, but an impossible combination of bad weather, engine problems, and confusing radio signals from Annette propelled the Electra towards disaster! Just a few days earlier, Joe had written his wife, Alta, “I miss you and love you. Godspeed our quick reunion and I hope I beat this letter to you!” Alta was at home in Anchorage with their young son, waiting for her husband’s return. Neither of them could have imagined the challenges they were about to face or the long difficult weeks they would both endure before the survivors of the Gillam crash were finally, amazingly, rescued. 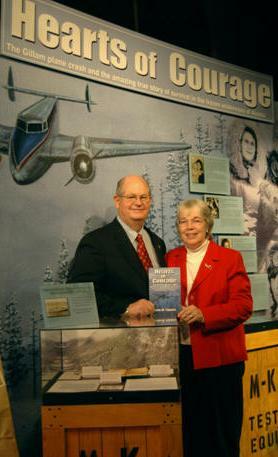 John and Bonnie Tippets at the Hearts of Courage exhibit in the American Airlines C.R. Smith Museum, Fort Worth, Texas. Hearts of Courage, written by John Tippets, is the account of his father’s ordeal and ultimate survival. In Joseph’s words, we learn of the death of one passenger and the pilot’s departure to find rescue. He is not heard from again. Joseph describes how the small amounts of food are shared and carefully portioned out to last as long as possible. And, as the days pass, the remaining four crash survivors take actions to find rescue. This is a story of courage and determination. And, for Joseph, who was the Latter-day Saint Branch President in Anchorage, and his wife, Alta, it is a story of faith and prayers answered. After almost three weeks, the four struggled down the mountain to make a new base camp where the two most seriously injured remained as Joseph and Sandy Cutting made their way to Boca de Quadra to try to find a way for rescue. At Weasel Point, they found the remains of an abandoned cabin and a small boat. With one successful roundtrip across the bay to the site of an old cannery, they decided to try a much more risky endeavor. Setting out for a second time in the small, leaky rowboat, a storm came up and they were cap-sized. Left to struggle back to shore, the two men were soaked to the bone by the icy waves and beaten against the slippery rocks. But all was not lost, as the matches were found dry, sealed in their bouillon cube tin with some adhesive tape. The fire they were then able to make warmed them through after their long struggle. In the coming days, it allowed them to roast mussels for a meager meal. And, on February 2nd, at mid-day, it allowed them to set a signal fire when a coast guard ship was sighted six miles up the bay. Twenty-nine days after the crash, Joseph and Sandy were rescued and they then participated with the Coast Guard in going back into the wilderness to find the two companions which they had left behind. Hearts of Courage is a piece of Alaska aviation history and an inspirational story to all who read or hear it. In March of 1963, twenty years after these miraculous events in Alaska, Joseph Tippets visited his birthplace and other SE Idaho cities. As the Assistant Administrator of the Federal Aviation Agency for the Western Region he participated in the inauguration of a series of FAA television programs over KTLE. While in Pocatello, Joseph was recognized by the local Chamber of Commerce for his “outstanding civic service.” He was made an honorary chief of the chamber and presented a beautiful full Indian headdress. Former President of the United States, Harry Truman, was one of those who had previously been so honored. As part of the recognition ceremony Joseph was given the title “Chief No Fly – Walk Out” referring to his trek to safety from the 1943 air crash in the Alaska wilderness. The book ‘Hearts of Courage’ is available from Aviation book retailers, Amazon.com and from some Idaho LDS specialty book stores. John Tippets also does presentations of this story using a PowerPoint with pictures, maps and other illustrations from the book) for interested audiences – he can be contacted at (johntippets[@]yahoo[dot]com). John Tippets has retired in 2008 after a 42-year career with the AMR Corporation, the last seventeen years as President and CEO of the American Airlines Federal Credit Union. He published Hearts of Courage as part of his larger project writing the life histories of his parents. John and his wife, Bonnie, live in Colleyville, Texas. They have four married children and are the proud grandparents of thirteen.